2:20 "may be a late rally"
8/11/2017 1:45:06 PM MT Al****:: Thank you, BBB. Well said. 8/11/2017 1:36:04 PM MT bbb****:: I feel the need to interject here. I have been watching these times for 10 years now I believe. I have never thought the time was a prediction of direction - that is a fool's errand. Rather it is a higher probability area. MT for a guy in here on a free day you sure seem butthurt about it. Have a little empathy - AL is doing this and has been doing this for a long time - and he is very good at it - one of the best. 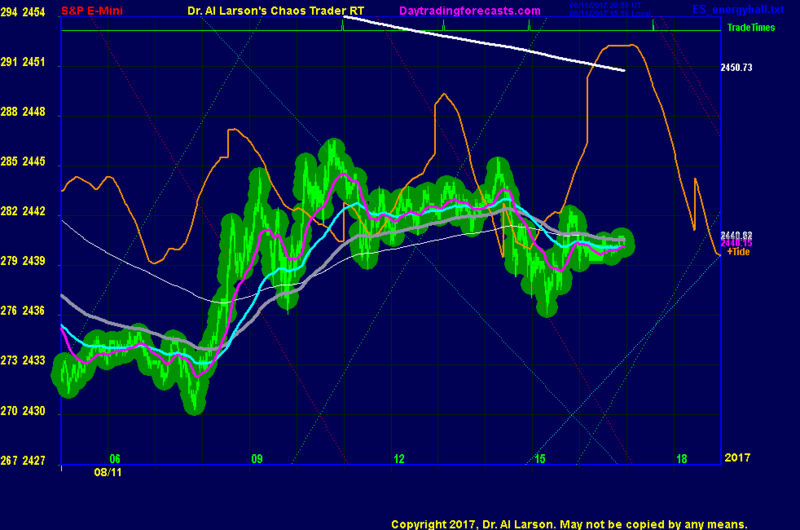 A 3 move test and a fourth break is a high probability entry, so maybe do some more homework. Al is probably best at money management and his track record shows it. But, by all means, please show us the way Gann traded so we can all make those perfect moves. The only guy I know of that has a very large knowledge of Gann and its applications is Jeffrey Cooper. But as for the impact that the markets get from the material Al has studied for years and years, there is no one better. We can tell you probably lost today and might be upset about it. Ego is a sign of weakness, not strength, in trading and Al has that part down cold. Relax and study - there is gold in Al's work. 8/11/2017 1:20:32 PM MT Al****:: As for Gann, beware the claims fore what he did. I do not believe anyone has duplicated his work. 8/11/2017 1:18:31 PM MT Al****:: You mistake the Chaos Clinic as all of my work; My Stargo forecast called this spectacular bull market; XGO forecast had me accumulating TSLA at an average price of 27. They also had me into FB at 36 when it gapped up. So please don't disparage my work during a free online session. 8/11/2017 12:53:29 PM MT . :: No need to swear at me Al, take the hint. Your method fails to predict the market, you put that down to the market being chaotic, clearly that cover you when your predictions are wrong. 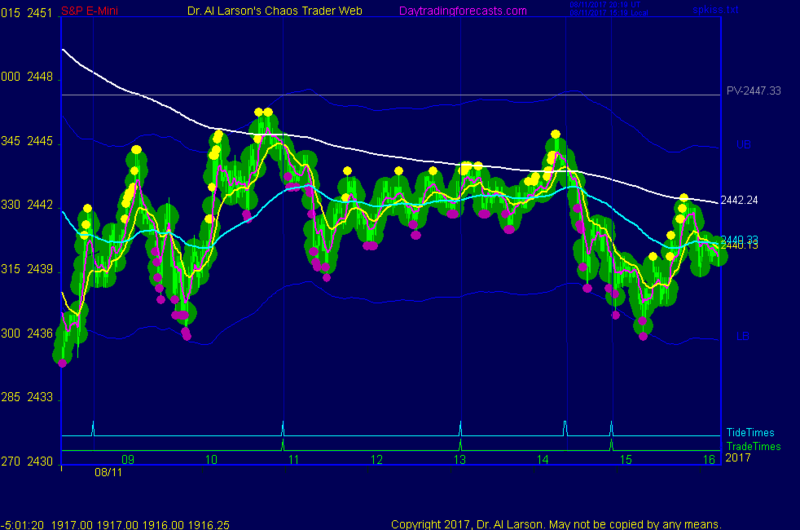 Gann hit 85% winning trades, predicted the price of wheat to the day and level. Clearly your research does not allow you to do that, so you would have to conclude that you have failed in your analysis and that you need to address this gap in your knowledge. 8/11/2017 12:26:25 PM MT . :: You miss the point Al, I can see from the way you trade that you have lost a lot in the markets, hence you trade scared. Your investigation into the planetary aspects were designed to give you some basis on which to make a trading decision, but they sometimes work and sometimes don't. This is due to your incomplete knowledge and lack of application of mathematical principles to your analysis. In short you only have half of the picture. Gann used solid principles in conjunction with his analysis, you don't hence your work will always be hit and miss. 8/11/2017 12:21:58 PM MT Al****:: "may be a late rally"
8/11/2017 11:34:28 AM MT . :: 1:28 rebought 2442.25 1:26 I may rebuy but I don't like sitting on a corpse 1:25 don't like it; out for 0 1:21 no a lot of juice yet, but I think it will come You seem to have very little faith in your material, firstly you talk about a green swan supporting the market. Then you talk about a a breaking of three highs causing a buy move, like you really know it will. Then on the first small pull back you are out like a scared chicken. Either it works Al or it fails, but you seem to have little confidence in your forecast. 8/11/2017 9:01:52 AM MT TG****:: GM AL, BBB, MM, Everybody.